Orsu Metals completes 2018 exploration works at the Sergeevskoe Gold Project, Russia. Orsu Metals Corporation (TSX-V: OSU) (“Orsu” or the “Company”) announces completion of the extended 2018 exploration program at its Sergeevskoe Gold Project in Russia. The program is designed to deliver an estimation of a maiden resource in Q4 2018. Dr. Alexander Yakubchuk, Director of Exploration of Orsu commented: “We completed the extended 2018 exploration program and are now working on delineation and correlation of the mineralized intervals, while some assays are still either pending or the samples are on their way to the analytical laboratory. Orsu believes that the results from 17,107.9 m drilling and 5,293.5 m trenching by the Company in 2017 and 2018 will form a solid foundation for the forthcoming resource estimate”. 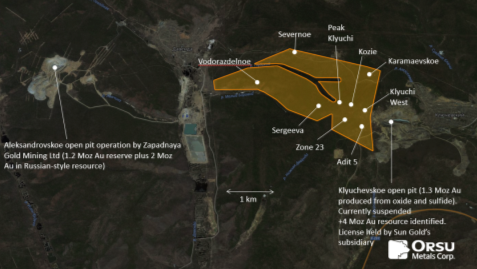 The license of the Sergeevskoe Gold Project occurs immediately east from the Alexandrovskoe open pit and plant owned by Zapadnaya Gold Mining Ltd and to the west from the Klyuchevskoe license owned by Sun Gold Mining (Figure 1)[i]. 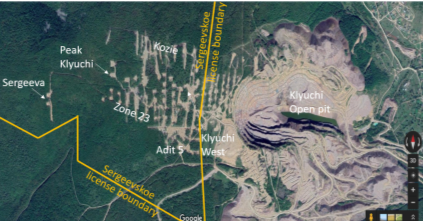 The Klyuchevskoe (Klyuchi) gold deposit represents a +6 Moz gold endowment (see Orsu press-release dated September 21, 2016). Orsu owns a 90% interest in the Sergeevskoe Gold Project (see Orsu press-release December 1, 2017).